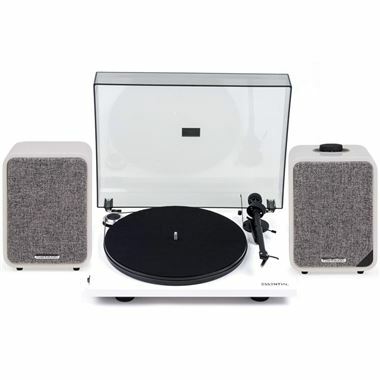 Ruark MR1 Mk2 Active Bluetooth Speakers with Project Essential III Turntable, discrete PreAmp and all required cables. Available with Online Finance and Free Delivery. We have partnered the diminutive Ruark MR1 active bluetooth speakers with a choice of highly reviewed Project Essential 3 turntables and matching pre-amp to provide a minimalist, stylish system capable of streaming audio from your tablets/phones, playing TV sound as well as enjoying your vinyl. The Ruark Audio MR1 Mk2 active speakers build on the performance of the originals and even retain the same compact dimensions, but their looks have been significantly enhanced making them even more appealing to design conscious customers. Whether in the classic Rich Walnut or chic new Soft Grey finish, MR1 Mk2 has been designed to look and sound great. The Essential III is a significant step forward for vinyl enthusiasts on a budget. The sound and the style have been pushed to new heights, all for a price that defies belief and can be further upgraded to the Essential 3A version which has the Acrylic platter upgrade - The Acryl-IT E platter offers an inert platform for your vinyl records to reduce the unwanted effects of resonance. Available for use with and without the supplied felt mat, the platter slots into a stainless steel bearing in a bronze bushing with Teflon-lined bottom for liquid-smooth rotation. The overall sound result is an open, detailed and rich soundstage that arrives at a foot-tapping tempo.